Just two years ago the Miami Heat had LeBron James on their roster, finishing with a 54-28 record and attempting a 3-peat against the San Antonio Spurs. What a difference a year makes. Last year LeBron decided to return to Cleveland which, compounded by injuries to Chris Bosh and Josh McRoberts, resulted in the Heat missing the playoffs altogether. To add insult to injury, Dwyane Wade elected to become a free agent at the end of the year, seeking a handsome deal or threatening to take his services elsewhere, and in-season acquisition Goran Dragic also was a free agent. Things could have gotten ugly in South Beach, but Pat Riley came out on top. Dwyane Wade didn't quite get the max contract he wanted, but decided to stay on board on a 1-year, $20 million deal. Slovenian baller Goran Dragic received a 5-year, $90 million deal. He is the Heat's point guard of the future. The backcourt duo joins fellow mainstays Chris Bosh, who hopes to be ready when training camp opens after being diagnosed with blood clots earlier in the year, forward Luol Deng (opt-in), Hassan Whiteside, Super Mario Chalmers, Udonis Haslem, Chris Andersen, Josh McRoberts, James Ennis en and Tyler Johnson. Guard Shabazz Napier, LeBron's Chosen One, was shipped to Orlando after just one year with the team. Goran's brother Zoran Dragic was traded to the Celtics for a 2020 second-rounder. 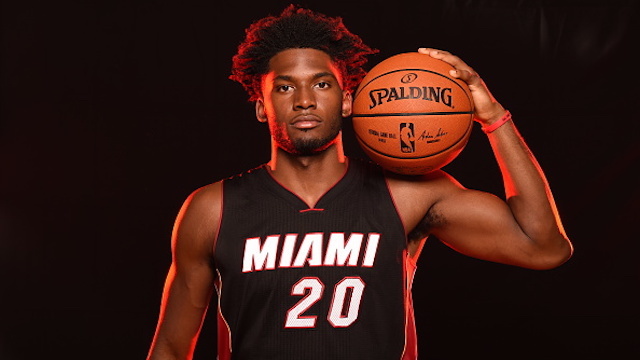 The NBA Draft fielded small forward Justise Winslow. He is such a prospect that Boston reportedly offered up to six draft picks to the Charlotte Hornets for him. The Hornets ended up selecting Frank Kaminsky, which allowed the Heat to nab him at #10. Winslow is another great piece for the future. Riley also added veterans Gerald Green and Ama're Stoudemire on cheap 1-year deals. Crisis averted in Miami. With The Flash and The Dragon on board, the Heat's starting five of Dragic-Wade-Deng-Bosh-Whiteside is as formidable as they come. It will be up to head coach Erik Spoelstra to use his versatile cast of bench pieces to get the most out of his team. If Bosh returns as his old self and the Heat can avoid brutal injuries, there is no excuse for them not to be in the playoffs.